I love this one, I've been trying to find autum boots with exactly this color and finish, ever since I saw it, but no luck yet. After trying out all of the varnishes from this collection, I can truely say it's a unique collection. I love their vintage look and feel. The rubbery finish is something that I can definitely see myself wearing. The application on all of these was excelent and the colors are very saturated. 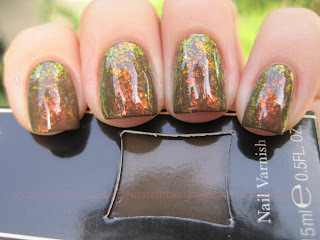 To see all the swatches from the Theater of the Nameless Collection click here. 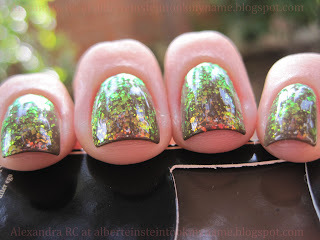 BONUS PICTURES - Illamasqua Taint with flakies! Taint is so beautiful it looks really nice on your skintone. I have that Taint and it's so pretty! 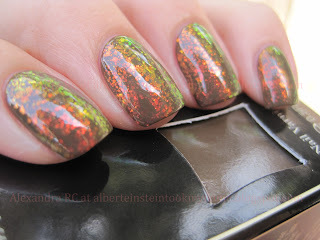 Ooh, I don't really care for Taint by itself but with the flakies it's gorgeous! It reminds me of autumn leaves. FLAKIES. dying. it looks like the polish embodiment of fall. i love it! A yellowish brown with flakies is something new, but stunning!!! !